WE’D RIDDEN WELL into the evening and it was nearly dark, so we threw our bikes over a farmer’s fence at the side of the highway, gobbled a quick pasta dinner chased by a Mars bar dessert, then opted to camp on the open prairie without a tent. Our gear was strewn everywhere as we fell asleep under the stars, oblivious to the tiny flashes of lightning on the distant western horizon. The storm arrived without warning in the middle of the night. In a matter of seconds we were pounded by heavy rain, with barely enough time to grab a tarp to throw over our sleeping bags. It didn’t help. Water came through holes in the plastic and pooled under us. Unable to sleep, my biking partner Neal and I could do nothing but wait. The occasional flash illuminated his face and wet hair, as he cowered in his sodden sleeping bag. 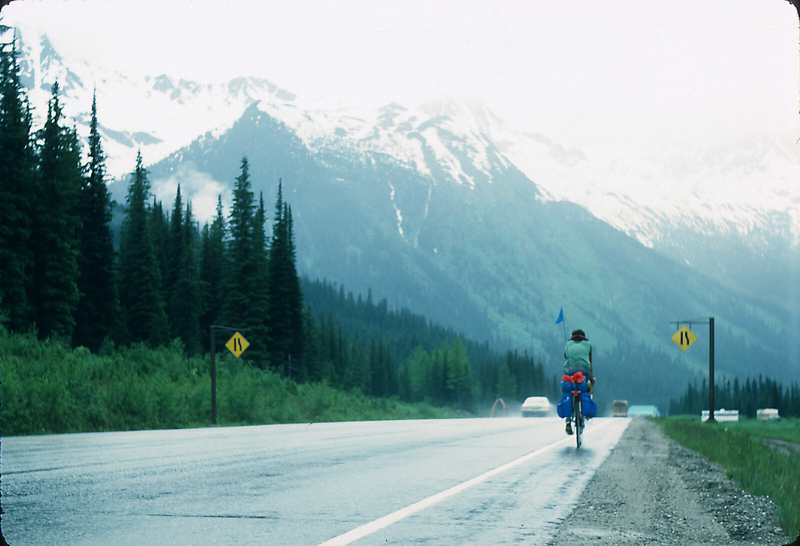 We’d been peddling our bikes eastward for over three weeks, starting at our home in Vancouver. 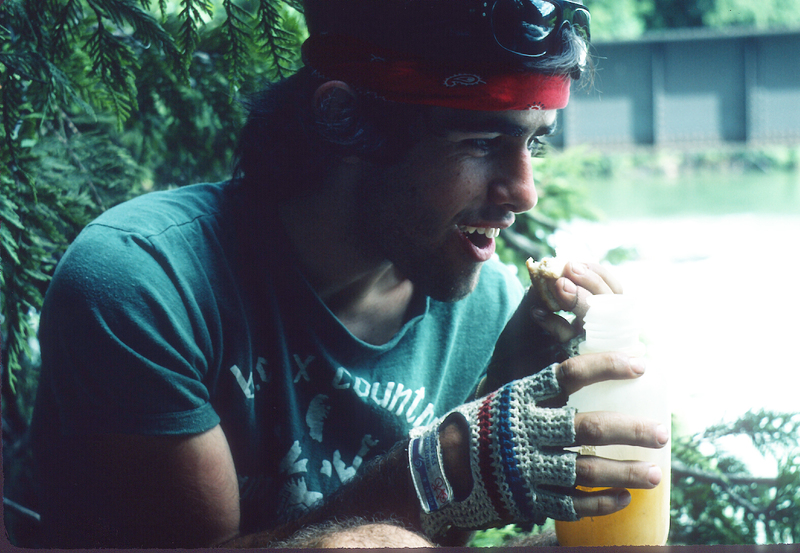 It was 1976 and we were both 18 – high school best friends, with several previous bike trips and loads of outdoor experience between us. A month earlier, our band had played at the high school graduation barbecue. Neal sang lead on “Stairway to Heaven,” I played rhythm, and another buddy handled the Jimmy Page guitar solo. Now in the middle of Saskatchewan in July, we were following the Yellowhead Highway as it snaked southeast towards Portage La Prairie, Manitoba. Our goal: St. John’s, Newfoundland. We arose to a leaden sky but warm temperatures following our camping mishap. I accused Neal of eating the last of my Mars bar in the middle of the night – or maybe it was the other way around. 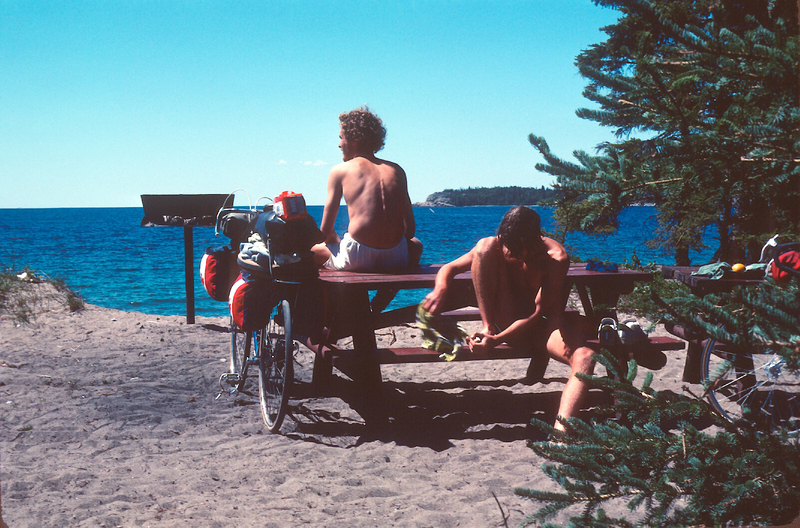 We didn’t speak much as we packed our wet gear onto the bikes and hit the road without eating. By 9 am we’d found a picnic shelter and the sun broke out as we cooked a hot breakfast. We began to laugh at our ineptitude. 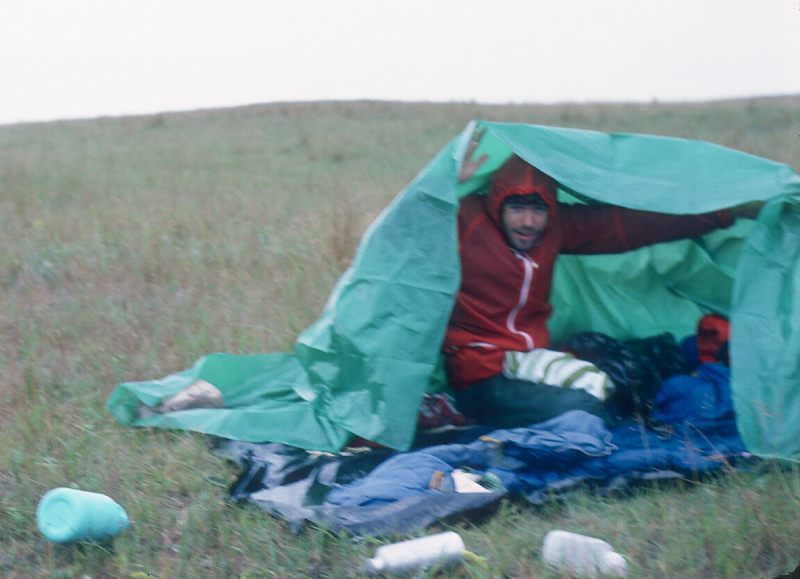 Most of our gear and clothes would dry quickly in the open air, but our sleeping bags were another matter. We got back on our 10-speeds and rode without stop for five hours until reaching Biggar (“New York is big, but this is Biggar”), where we found a laundromat with a barely functioning dryer. By evening our spirits had returned, at least until we went to bed and found our down bags still uncomfortably damp. 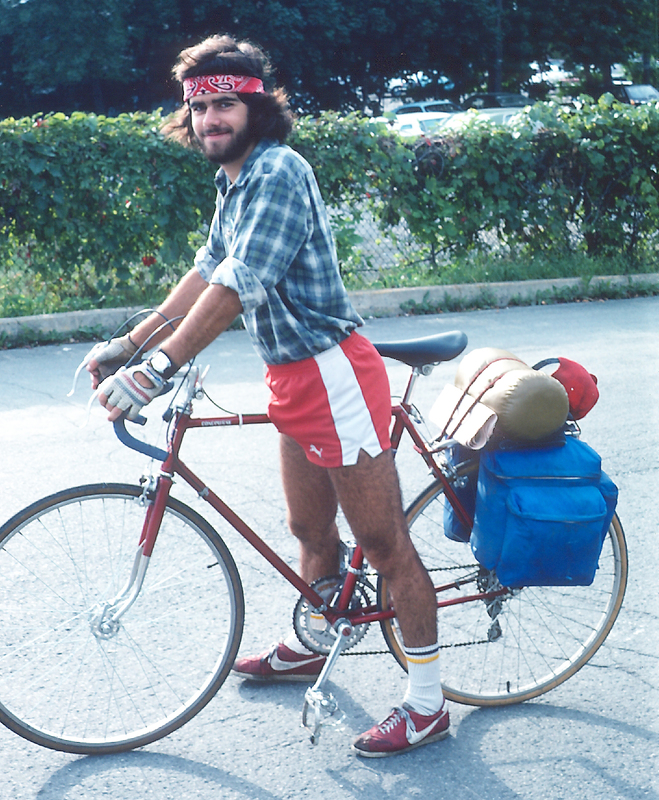 It took Neal and I a long time to get the hang of long distance cycling, our bikes loaded with 30–40 pounds of stuff. We’d often procrastinate our morning departure. Then, wanting to reach a pre-set destination, we’d have to ride until dusk, sometimes with bandanas over our mouths so we wouldn’t swallow the evening bugs. We did have one amazing prairie day with a strong westerly, zooming 100 miles in less than six hours. But more typically we averaged 60-70 miles on eight hours of riding, mostly under a blazing sun. With breaks for cooking, eating and re-supply, that meant a 10-hour day of steady work. We loved the B.C. mountains, despite a campsite encounter with a black bear that left us with damaged bikes and equipment. The prairies were a revelation of green wheat, upside down hills (river valleys carved out of the landscape), hot, dry weather and a forever beckoning horizon. We became obsessed with distance, charting our progress on the map every evening. We reached the Ontario border in late July or early August. Having crossed four large provinces already, we felt like we’d arrived. We knew full well that Ontario was another order of magnitude in size, but the sign at the border was still a shocker. It read something like: “Kenora: 35 miles. Thunder Bay: 500 miles. Sault Ste. Marie: 1,000 miles. Toronto: 1,500 miles.” Montreal was another 350 miles beyond that. At this point, we had only ridden about 1,500 miles, so we were less than halfway there! Our hearts sank. Luckily, we caught up with another cross-Canada cyclist in far northern Ontario, and Jim taught us a new tripping technique. Rise early (before 6), pack up, don’t eat a thing, and ride. After two hours, we would stop for a quick breakfast, but we’d get back on the bike as fast as possible. The goal: to ride two-thirds of our daily miles before lunch. That’s 80 kilometres by today’s measurement, the distance from my current home in Guelph to downtown Toronto. Ride that distance every morning, on a heavy bike, every day, six days per week. That’s what Jim taught us. As a result, our daily average increased to 75 miles. We rode in a line, not fast, but mostly close together. If Jim raised his bum off the saddle a little, you had to brace yourself: a fart was on its way, and you couldn’t avoid it, even in the open air. The beauty of Jim’s system was that we could coast a little in the afternoon. We’d go for a swim in the frigid water of Lake Superior, hang out with the giant goose in Wawa, or stop at McDonald’s for a “snack” – buying as many of those little 30-cent hamburgers as we could stomach. Jim called them “cookies” and I think he gobbled a dozen in one sitting. By the time we left Jim in southern Ontario, Neal and I were converts to his system. 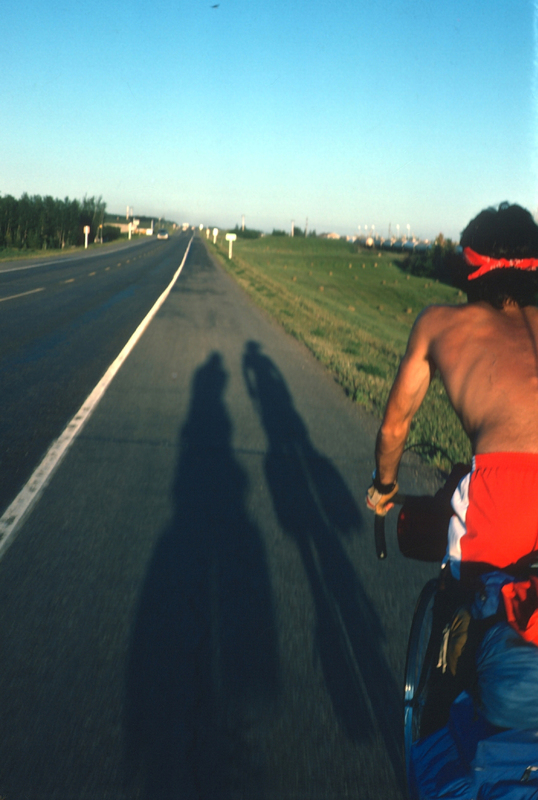 Our final day was a 120-mile ride from Ottawa to Pointe Claire, Quebec, our longest ever. We arrived in western Montreal in time for supper at my aunt’s house, no sweat. Food was our fuel. Water was our lubricant. We tried to boost the water with orange Tang, but it tasted awful when it got warm in the bottles, so mostly we stuck with water, collected from gas station hoses and washrooms. Our big meal of the day was lunch. We’d buy a loaf of bread, line the 20-odd pieces up along a park bench, then make sandwiches, assembly-line style. Margarine, tomatoes, cucumbers, mayonnaise, cheese, peanut butter, lettuce, honey, jam – we kept it pretty simple. We’d stack them up, five thick sandwiches apiece, and go to work. We almost never paid for a campsite, and we rarely went to restaurants, McDonald’s snacks notwithstanding. Our whole two-month trip cost me only $350 – and that included the $100 flight home. We shared our funds by alternating cashing a $20 traveler’s cheque, once or twice per week. This was thrifty, even for the era. We ran a little pantry in our bike panniers with four plastic containers of the staples: peanut butter, jam, marg and mayonnaise. Yes, mayonnaise. It was sold on store shelves after all – no one ever said it needed refrigeration after opening. As each container neared empty, we’d buy another glass jar to top up our supply. This caught up to us on the eastern side of Lake Superior. We had a leisurely cooked lunch, making a massive potato salad that Neal and I shared. Later that afternoon we descended into Montreal River Harbour down the steepest, longest hill we’d yet experienced in Ontario, a huge thrill. 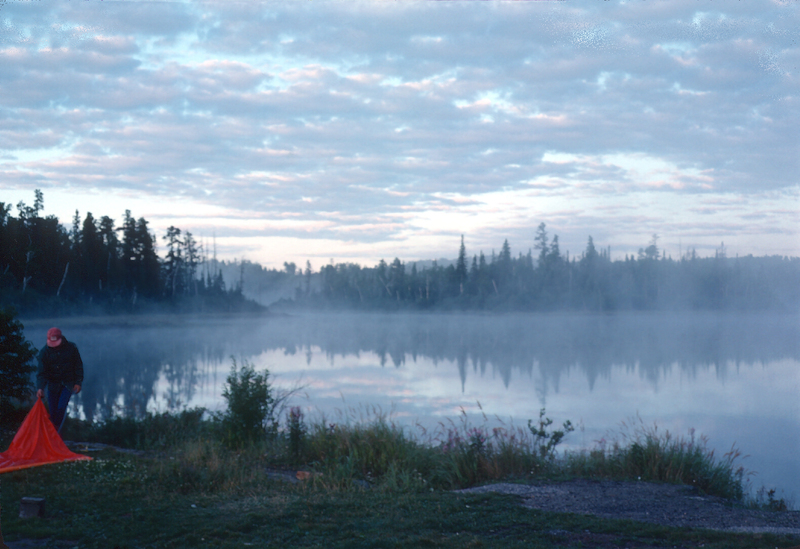 We camped in a gravel parking area sandwiched between the massive lake and the Trans-Canada, and promptly crashed. I awoke around 1 am with a powerful urge to puke. I quickly alerted Neal as I fumbled with the zipper to our pup tent. Too late. Neal recoiled to the rear of the tent as I tried to save my stuff from destruction – my gag was spreading inexorably along the vinyl tent floor. I spent most of the night outside, leaching from both ends. It was cold, with a damp breeze blowing off the lake. I’d never felt so miserable in my life. Neal didn’t feel well either, but wasn’t sick. In the morning, Jim arose from his own tent, oblivious to our misfortune. Neal went out to give him the news. I tried to follow, stood up gingerly in the sun, and promptly fainted. I spent the rest of the day lying in the shade, watching bugs crawl in the weeds. Jim rode on ahead to a hostel in the Sault where we re-joined him the next day. Neal talked to other campers, one of whom took pity on us, donating apples and a package of Jiffy popcorn. 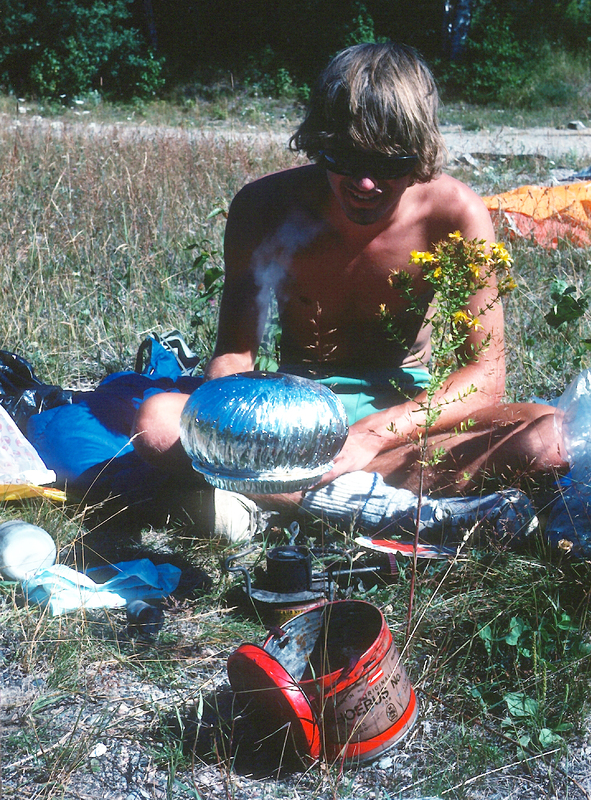 That was my recovery meal: a batch of jiffy-pop cooked expertly by Neal over the hot flame of a naptha camp stove. We immediately threw away the container of mayonnaise and never bought the condiment again. To this day, I’m extremely wary of potato salad. Can you even ride across the country on a bicycle today? How do you get around restricted access highways like the 400, north of Barrie, which is still the Trans-Canada after all and the only route around Georgian Bay? Neal and I were cautious on the road, but still very exposed. No bike helmets. No bike shoes or shorts. Our only real bike gear was cheap padded gloves. 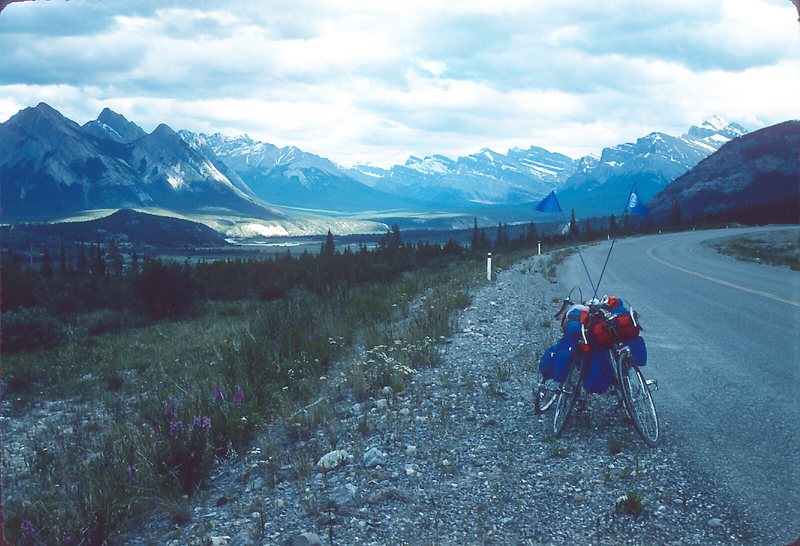 For a while we sported bike flags, but they were flapped to shreds by the time we crossed Alberta. We learned to fear a crosswind, which would greatly amplify the effect of a passing truck, even one in the opposite lane. We had no bike mirrors, but were carefully attuned to what was approaching from behind. By far the most common and dangerous situation was the oncoming passer. This happened nearly daily on two-lane highways. Two oncoming cars hurtling straight at us, one in each lane. Either the passer didn’t see us when beginning the maneuver, or didn’t care. We’d shake our fists and yell, but inevitably had to veer onto the gravel shoulder, skidding to a sudden stop in the soft ground. Less serious, but also very common, were rural dogs. We didn’t fear the yelping, excited ones. They never had a grasp of the angle for intercepting us – a quick acceleration and we were easily free. But when we saw a big dog flatten its ears, get into a sprint and set a trajectory for a point well in advance of us, it meant trouble. We didn’t fear being bitten so much as a collision at high speed. One such chase ended tragically. A German shepherd bolted from its farm on the opposite side of the highway from us, its owners shouting from behind. As it crossed the highway from our left we could hear traffic coming up behind us. I glanced back to see a pickup truck approaching quickly. I thought the dog would make it safely past, but he saw the truck too, and hesitated for a fatal split second. I heard a sickening thump, the truck flew past, and the dog lay motionless in the middle of the road. The family ran up the driveway towards the horrible scene. The truck stopped, so did we, but we didn’t linger. The swiftness and finality of the accident wasn’t lost on us. I’m headed home. Neal is headed to Newfoundland alone. 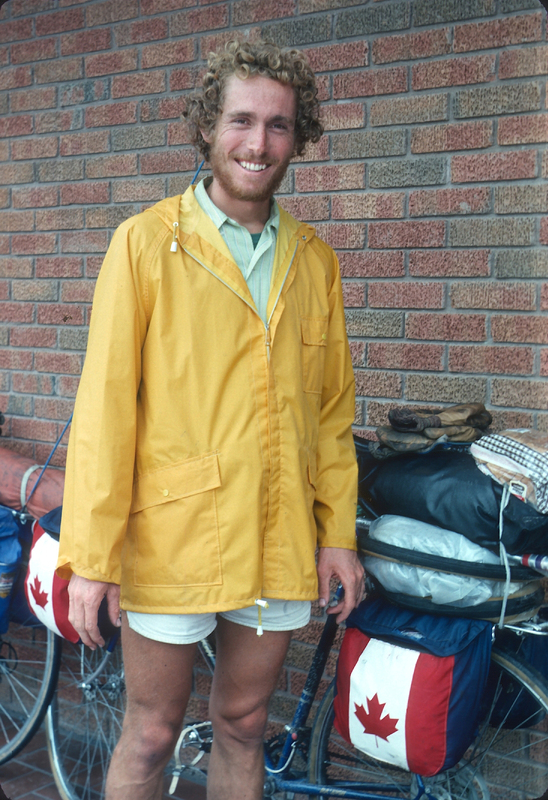 Our original plan was a coast-to-coast trip, but I was accepted into a fall youth exchange program and had to leave Neal in Montreal. We’d ridden 3,000 miles over two months together, with 45 days in the saddle. At the Dorval airport we re-arranged our gear and I said a reluctant goodbye, catching my five-hour flight back to Vancouver. Neal spent another month or so completing the trip solo, right to Radar Hill outside St. John’s, Newfoundland. Victory! I returned to Montreal by train the next summer to complete my own trip, beginning in August. This time, I traveled differently. I still rode 8–10 hours a day, but I wasn’t so fixated on my destination and I eschewed any direct route. I meandered for a month in Quebec, visiting my new Quebecois friends from the previous year of travel, riding north to Lac St. Jean, then up the north shore to Baie Comeau. It was lonely, especially in September, with few other campers and travellers to run into. I saw school buses one morning in New Brunswick and suffered a crisis of confidence: what was I doing out here on my own, as the weather turned increasingly cold and cloudy? I had to get off my bike for an hour before summoning the resolve to continue. On a solitary stretch of highway between Antigonish and Guysborough a tabby kitten suddenly lept out of the ditch. I stopped. It rubbed against my leg, then against my bike chain, covering its fur in black grease. I rode on ahead, and saw the kitten loping along behind me. I tried to ignore that, but then a large truck passed me from the opposite direction. I remembered the German shepherd and turned back to rescue the stray kitten, still scampering down my side of the highway. “Nish”, as I named her, became my biking companion for the remainder of my trip. She dozed inside my shirt as I rode, and explored the woods around me at night as I slept. On a rainy day in Guysborough, a local family spontaneously invited me in for a lunch of fish chowder when they saw me riding by. Surprised to find two of us, they fed Nish too. By the time I reached Sydney, N.S. it was October and I’d made a bad miscalculation. The seasonal ferry to Argentia – on the eastern side of Newfoundland and close to St. John’s – was no longer running. My only choice was the Port aux Basques ferry to the west coast, which meant a 1,100 mile, 2–3 week return trip across the massive island. I didn’t have the clothing, the camping gear or the resolve for that in the waning days of fall. I decided to hitchhike with my bike and kitten instead, which still took a week. It was always a conversation stopper when Nish emerged from under my jacket in the car, but most Newfies loved it. I usually got rides in pickup trucks, which made transporting my bike easy. But on the return trip, an older couple in a small sedan insisted on giving me a ride. I could fit my gear into the trunk, but not the bike. We removed the wheels and squeezed the dirty frame into the back seat. To my surprise, the driver insisted that his wife sit in the back seat with my bike, while Nish and I rode shotgun up front. I protested, but they both insisted. Such is Newfoundland hospitality, or perhaps rural marital relations. ← Who stole Church of Our Lady from Starkey Hill? That was some great adventure! I suggest the someday should be by rail. I really enjoyed our cross Canada train trip from Halifax to Vancouver in 1997. That is if you don’t feel quite up to running it! Hi Art . Hope all is well. This was a great read my friend. Envy your adventure. Tried to do the same thing on a much smaller scale back in about “80”. One day away from leaving , and had to cancel. Won’t get into that. Any way thanks for the share, and take care. Just saw this — thanks David! It was a long time ago, but still a vivid memory.